An expansion of the Brooklyn Bridge walking and biking path could get underway by 2019 if it’s folded into a rehab project that’s already in the pipeline, DOT Commissioner Polly Trottenberg said this afternoon. The path is as narrow as 10 feet at pinch points and cannot comfortably accommodate the thousands of people who use it each day. For now, the next step is a $370,000 feasibility study slated to wrap up in seven months. DOT has already conducted a preliminary assessment of conditions on the bridge path and posted a working concept for the expansion [PDF]. The idea is to widen the pathway by building on top of the steel girders that run over the bridge’s main roadways. 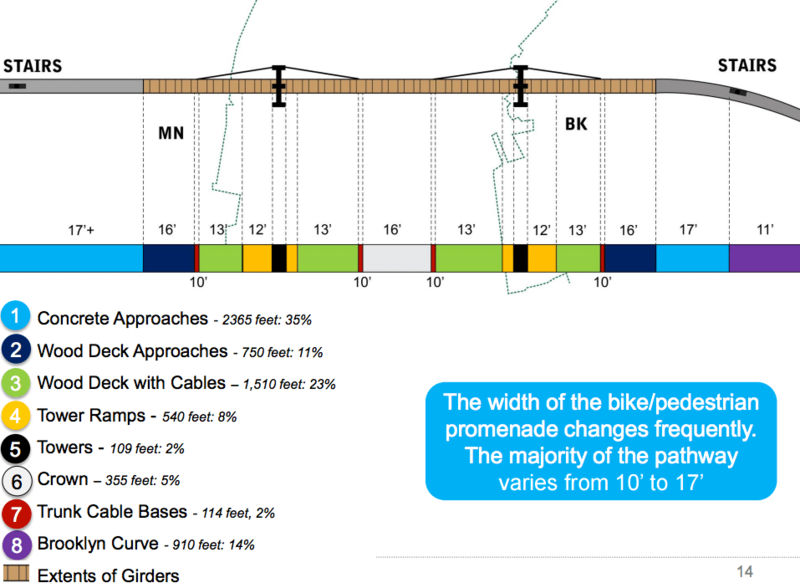 Most of the wooden deck for walking and biking is four feet below the girders, so the expansions would be at a higher grade than the current path. Trottenberg said DOT will also explore expanding the concrete approaches to the wooden deck on both the Brooklyn and Manhattan sides. In addition to the engineering challenges of expanding the bridge path, Trottenberg said DOT will also have to coordinate plans for the 133-year-old bridge with NYPD’s Counterterrorism Unit, the Landmarks Preservation Commission, and other agencies. Asked about the timing of the project — which advocates and elected officials have wanted for years — Trottenberg and DOT Deputy Commissioner Ryan Russo told reporters that the agency did not previously have the funds to undertake an expansion of the path. “In terms of the moment, we’re not that far from the era when we struggled to keep the bridges up,” Russo said. Offices have a lot of floor space that isn’t occupied by people, e.g. desks, tables, aisles, etc. It seems that office lobbies would more closely resemble the loading that can occur on a bridge walkway. People are jammed together shoulder to shoulder. Is there a separate loading factor for office building lobbies? If so, what is it? This proposal makes zero sense to me. There are 3 main roadways lanes, and bikes are relegated to the middle—buuuuut they still share that roadway with pedestrians? Why is there still a single 4 foot lane for pedestrians on the bike deck? Without a barrier they’ll never stick to that narrow 4 feet and will inevitably spill into the bike lane and cause collisions. This doesn’t solve the problem. The only way to solve that is to designate a barriered and protected space only for bikes and no pedestrians. If you’re going to single out one group for a discriminatory tax, then make the pedestrians pay, they’re mostly out of town tourists. The cyclists are locals just trying to commute to work.